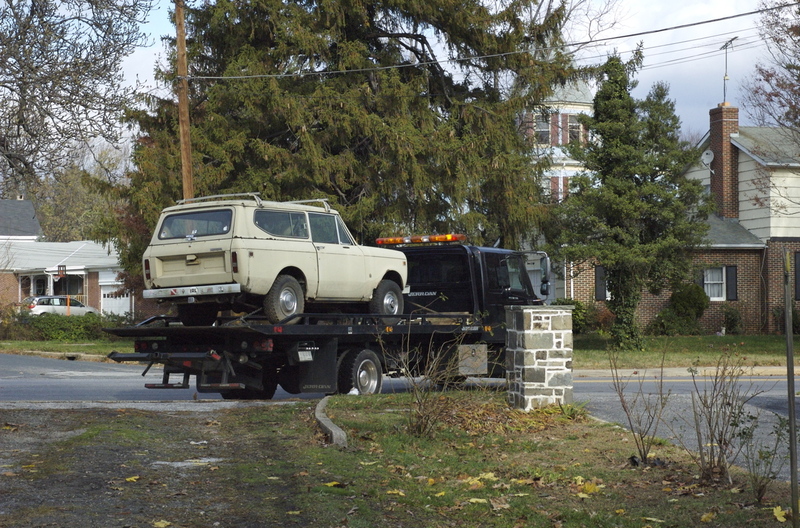 Way back in the fall of 1991, my college roommate Pat returned from summer break behind the wheel of a 1979 Scout Traveller, and had it at college for the next two years until the body mounts rotted away. Having driven it quite a bit (all the way down to Sarasota, Florida) I really enjoyed the feel of a larger truck- I was driving a Mazda B2000 pickup at the time. He moved to NM after we finished school and I kept the thought of buying a Scout in the back of my head. 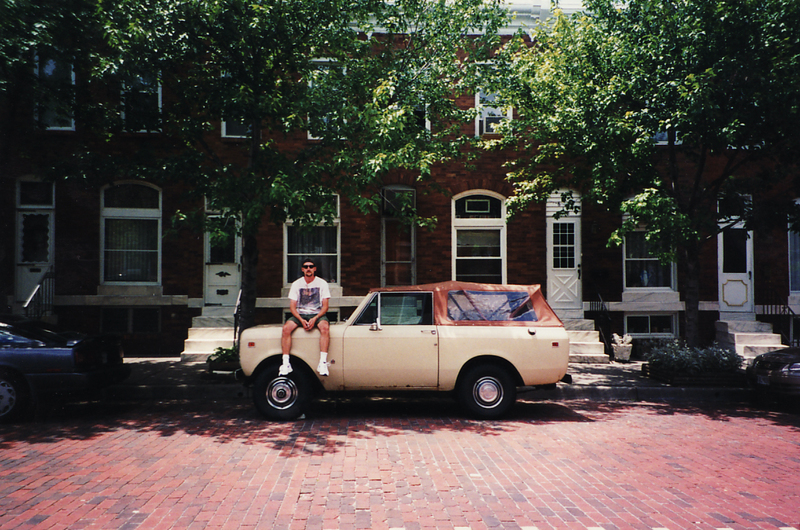 In March of 1998, after a few months of research, I bought a bone-stock 1978 Scout II from a nice fellow up in Lancaster, Pennsylvania. The truck had 92,000 miles on the odometer and a relatively mild case of Scout rot. Apart from the usual creep around the rear fenders by the bed seams and on the bottoms of the doors, the truck was straight as a pin. The truck came with a T-19 wide manual, 304a V-8, hi-back buckets, the original AM radio, and a Chilton’s. For the asking price, I got a Kayline soft top as well as the factory hard top; the original hubcaps, a spare set of manual hubs, new halogen headlamps and a set of Hella foglamps mounted and keyed to the dimmer switch. Within a month, I had a rollbar installed and later a Tuffy console for between the seats. 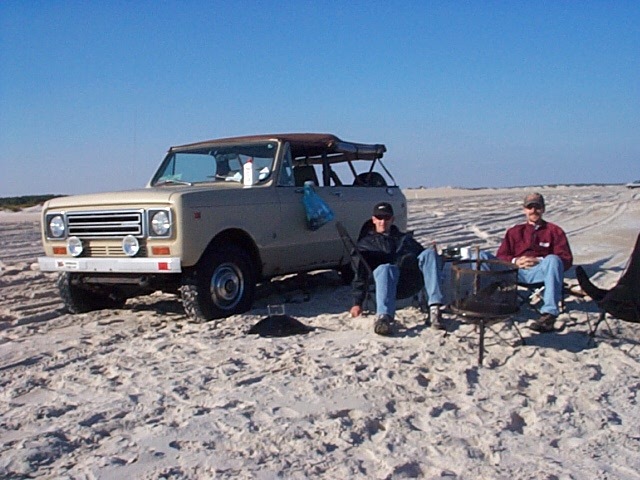 In the ten years I owned her, we went to the beach at Assateague, MD several times, Nag’s Head NC, Myrtle Beach SC, upstate New York to four-wheel in my grandfather’s fields, and the streets of New York City. 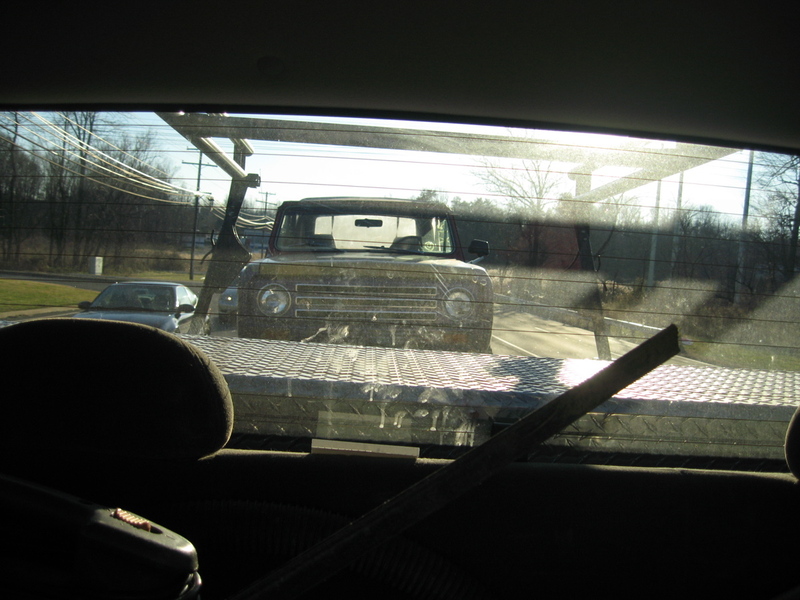 Time and salt began to catch up with us, though, and by the time my wife and I moved to a house outside the city, the dual exhaust had to be hacksawed off, rust had bowed the floors, and cancerous body mounts made closing the doors difficult. I parked her in the driveway while we worked on the house, hoping I’d be able to work on the worst parts, but by the time I had some money saved, it was too late. After showing her halfheartedly to a few people who wanted to part her out, we lucked out and sold her as a surprise christmas gift to a great new owner, and I’ve become good friends with him. He’s taken the time to tear her down to the frame rails in preparation for a fiberglas tub, and I can’t think of a better, more loyal truck for such a deserving driver. After three years without a running Scout, I suddenly found myself talked into attending an auction where I suddenly and surprisingly won a used but clean rig with a lot of new and lightly used parts. It wasn’t running on the day of the sale, but the guys at the yard claimed it just needed a fuel filter. After fifteen minutes of tinkering and a new battery, it roared back to life, and the transmission and transfer case checked out perfectly. It’s titled as a 1976, but the VIN is affixed to the driver’s A-pillar with sheetmetal screws and the paint dates the tub to 1975. Overall the sheetmetal is in fantastic shape. There are a few patches welded into the bed here and there, but overall it’s in better condition than all of the tubs I’ve looked at in the last eight years. It’s got a strong 345, and a BW T-19 wide transmission. 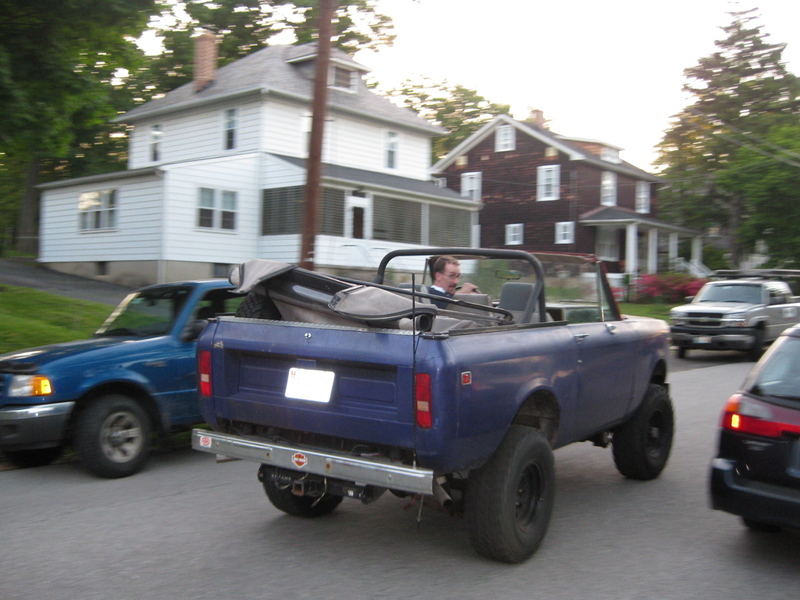 The previous owner added a 2″ suspension and 2″ body lift, which look very professionally done. It has a set of almost brand-new 32″ BF Goodrich tires on black American Racing rims, a black Kayline top, a bikini top, a full-size spare, and a pair of ugly aftermarket high-back bucket seats in decent shape. Overall, it’s not quite the Scout I saw myself owning (I’m more of a stock look-and-feel guy) but this has a certain appeal, and much like the house I bought, I can see through the rough edges to the potential within. With some much-appreciated help, I cut a pair of doors into my rickety garage and got it in out of the elements. I don’t have tons of money to throw at it right now, so it’s going to sit indoors and wait until I’ve got some time and cash, and then it’s going to get a sanding, plenty of POR-15, some updated interior components, and a new paint job. Stay tuned here for updates as they come.